Sight Reading for the Musically Impaired: This course will teach you how to figure out whether a hymn is suitable for piano, guitar, or a capella singing. In addition, you will learn how to determine if a hymn goes above and/or below the normal human vocal range, and whether or not the rhythms of the hymn can be successfully sung by middle-aged white people. 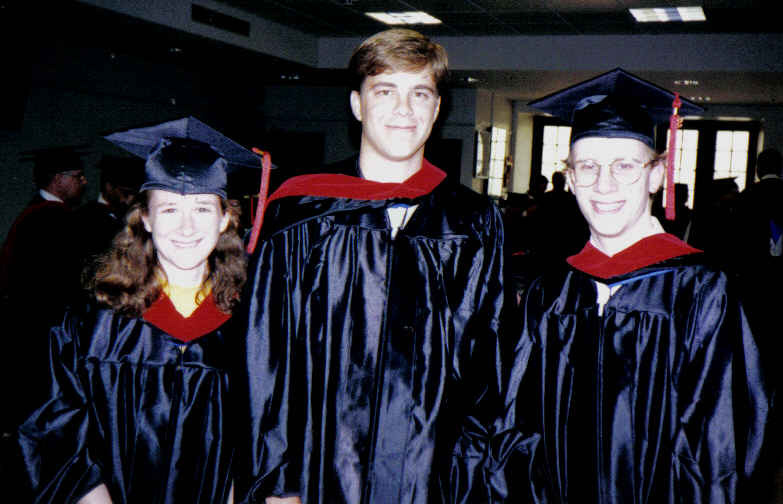 Me, my beloved husband, and the also beloved Brian Hastings at our graduation from Eastern Baptist Theological Seminary, 1999. Responding to Hate Mail: We will address appropriate responses to both individual notes of frustration, anger, and hate, as well as what to do when such a letter is distributed via computer technology to the majority of church members. The primary text for this course is Matthew 5-7. Deep breathing exercises will be taught. Building Maintenance 101: Learn how to fix a leak, unclog a drain, change a furnace filter, set an electronic thermostat, replace torn window screens, sew curtains, wax floors, paint parking lot stripes, and use a chain saw to cut down dead trees. How to Be Christ-Like with Telemarketers: Learn effective strategies such as passing the buck (“I would be happy to give your information to our sub-committee on children’s art supplies.”), reverse evangelism (“Actually, we have our own revival scheduled for next week. If I could just get your contact information I’ll get some brochures in the mail.”), and foreign languages (“Par lay voo fran say?”). Those who earn a C or lower in this class will be recommended for the alternate class: How to Hire a Gracious Secretary and Set-Up a Caller I.D. System. I could go on. And on. And on. (Feel free to leave a comment about what classes you wish you could have taken in seminary.) But you get the point. I, as the pastor, cannot do all that is necessary for our church to do the Kingdom work to which God calls us. And if I took every class that was relevant to some aspect of ministry, I would still be in school . . . probably until I keeled over of old age while trying to learn how to re-wire a hearing aid. Thank God for the body of Christ! One of my deepest delights as a pastor is watching the Holy Spirit bring together just the right people to get the Kingdom work done. It is a humbling honor to work with the Spirit in choreographing the movement of the body. LOL All of them too true…well put!